— Observance of Company labour standards. — Young and friendly team. — Wish to work, to develop, to improve, interpersonal skills. — The work place is offered taking into account the place of residence: metro stations Novokuznetskaya‚ Alekseyevskaya‚ Kiyevskaya‚ Semyonovskaya‚ Voykovskaya‚ Tulskaya‚ Tsvetnoy Bulvar‚ Pushkinskaya. — Non-full service of the restaurant guests. — Ready to perform a large amount of work. — Work in close propinquity to the house‚ within walking distance of the metro stations Alekseyevskaya‚ Novokuznetskaya‚ Kiyevskaya‚ Semyonovskaya‚ Voykovskaya‚ Tulskaya‚ Tsvetnoy Bulvar‚ Pushkinskaya. — Cash on hand report. — R-keeper knowledge is prefered (free training is possible), candidates without work experience are also invited. — Work in close propinquity to the house, within walking distance of the metro stations: Kiyevskaya‚ Voykovskaya‚ Tulskaya‚ Tsvetnoy Bulvar‚ Alekseyevskaya‚ Novokuznetskaya‚ Semyonovskaya‚ Pushkinskaya. — Candidates having no experience are also invited. — Hostel accommodation (if required). — Control of the cooks shift. — Young and friendly team;. — Participation in the production process. A chef is required who demonstrates how to work according to the company standards through personal example. — Place of work m. VDNKh, Yaroslavskoye shosse, H. 26. — A chef is required who demonstrates how to work according to the company standards through personal example. — Sales of ready-made meals at the food counter (without cashiering). — Shop assistant experience is preferable. — Observance of products filling and output weight requirements according to the process charts. — Neat and accurate, team player. — All restaurants are within walking distance from the metro stations: Kiyevskaya‚ Voykovskaya‚ Tulskaya‚ Tsvetnoy Bulvar‚ Alekseyevskaya‚ Novokuznetskaya‚ Semyonovskaya‚ Pushkinskaya,VDNKh. — Good housekeeping at the food counter. — From 18 up to 35 years old. — Opening hours: 2/2‚ 5/2. — Work place : all restaurants are within walking distance from the metro stations Kiyevskaya‚ Voykovskaya‚ Tsvetnoy Bulvar‚ Alekseyevskaya‚ Novokuznetskaya‚ Semyonovskaya‚ Pushkinskaya,VDNKh. — Neat and accurate, diligent. — Working together with Italian and Cuban chefs. — Citizenship of the RF. — Observance of operating practices for semifinished and ready-made food preparation. — Place of work m. Confectionary shop produces confectionary for our restaurants chain. — Знание ротационных, ротовых, и подовых печей. — Приготовления фарша для кондитерских изделий согласно технологической карте. — Place of work m. Welcome. — Своевременная доставка заказа (еда из ресторана «Грабли») по адресу клиента. — Выплаты раз в две недели. — Желательно с опытом работы. — Правильная их эксплуатация, своевременный и качественный ремонт. — Умение читать эл. схемы, знание сантехнического оборудования. — Career and professional development. The company rate highly employees contribution into the business and appreciates their personal achievements. The employees wages depends on their qualification level and increases as long as the professional behaviors develop. Annual appraisals are held to evaluate the employees’ qualification level in accordance with Labour Code of the RF. In the Company in addition to the wages there is a unique system of payment confined to the employees’ personal achievements. According to the results of each month the employees can have an additional payment in addition to their wages. Competitions are held in the Company divisions that help the employees to approve themselves and add a significant amount of allowance to the wages; the employee receives one-time allowance if he brings a new comer which passes probationary period. The Company takes active measures for develop young specialists and let them to build their career in the Company. In the Company there is a staff turnover system allowing to manage any specific job. It’s much more than that you can find in our big and friendly business team. VDNKh metro station, take the last subway car, pass the glass doors, then take the stair to the left. 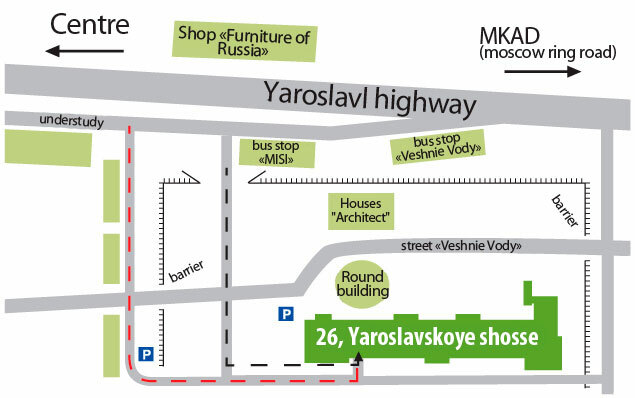 Then take a bus: 144, 244, 136, 172 till the bus stop MISI (МGSY (Moscow Civil Engineering Institute)). You see light gates in front of you, enter them and go straight ahead, to the left you see wooden houses “Zodchiy”, but you shall go straight ahead and to the left from you there is a round building, go still straight ahead to the long rectangular building “Yaroslavskoyoe shosse, 26”, go around the building and then to the left to the end of the building following the indicators “Staff entrance — HR”. Go up the second floor. Tel +7 (495) 545-08-36, +7 (962) 943-13-03 . You must have: a passport, a work book, a diploma (a document on education), a medical card.